This taunting jingle was well known in the slave trade. The Bight of Benin was a particularly dangerous area for Europeans as diseases like yellow fever, smallpox, typhoid, sleeping sickness, and malaria, to which they had no immunity, were the most common. The Bight extends from Ghana to Kongo, it was the hub of the “Slave Coast” and most enslaved Africans were brought to the Americas from this region. As much as sickness was a major risk for European mariners, getting to the Bight posed its own problems. Reliable charts were essential to sailing safely. Without knowledge of strong currents, hidden shallows, dangerous rock formations, and natural harbors where provisions could be acquired, ships had little chance of surviving a long voyage. During the late fifteenth century, the Portuguese became the first Europeans to dare to sail down the coast of Africa. Each ship’s pilot noted landmarks as well as hazards before returning home. Gradually they had guides to the entire coast and, in the process, set up lucrative trading partnerships. The Portuguese did not share their information with other nations. They knew that their charts gave them a significant advantage—their traders could travel safely where others could not. 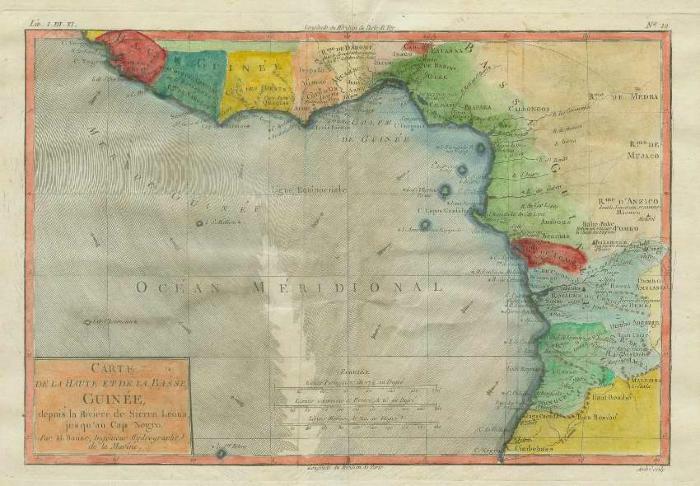 Portuguese dominance in the Africa trade lasted for over a hundred years but eventually their charts were stolen, copied, or recreated and, by the mid eighteenth century, the Dutch, English, French, and Swedes were all coming to Africa regularly. As the coast of Africa became more familiar to Europeans, increasing accuracy was expected from charts. However, it was not until 1773, when Rigobert Bonne succeeded Nicholas Bellin as the Royal Cartographer of France, that geography was understood as a science. Setting aside the fanciful elements that adorned earlier maps, such as sea monsters and compass roses, Bonne led the office of the Hydrographer at the Depôt de la Marine to assemble maps that were detailed, elegant, and practical.